Art theory has been hardly willing or able to formulate a coherent picture of visual art since the 1990s. While practitioners like the Young British Artists have resisted any theoretical embedding of their works, theorists, such as the curators of the biennales and documentas, have for their part failed to reflect on the art that has been exhibited. This, at any rate, is the contention of editors Margriet Schavemaker and Mischa Rakier in their introduction to Right about Now. 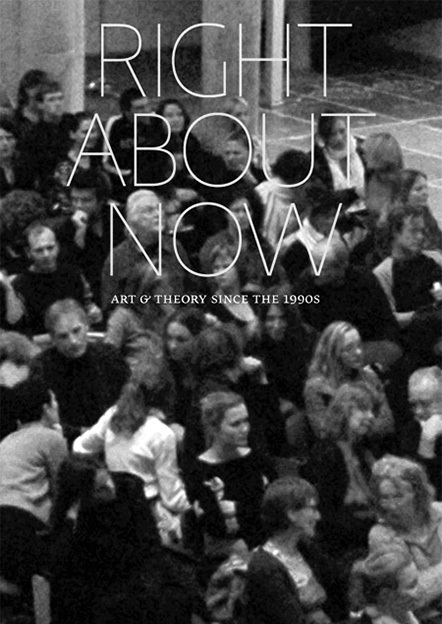 Art & Theory since the 1990s, published in the wake of the 2006 lecture series of that name, organized jointly by smba, the University of Amsterdam and W139. According to Schavemaker and Rakier, art and theory have parted company since the 1990s and become separate disciplines once again. The title of the book, in which the edited lectures are arranged under six themes, flirts a little with the hefty 2004 art-historical survey, Art since 1900. As does the organization of the anthology. But whereas Art since 1900 can be read as a chronological narrative, in Right about Now that possibility is denied the reader. The compilers profess themselves unwilling to fill the perceived gap left by the lack of coherent analyses with a comprehensive linear tale. The question is whether they have succeeded in their purpose. The six themes – ‘The Body’, ‘Interactivity’, ‘Engagement’, ‘Documentary Strategies’, ‘Money’ and ‘Curating’ – constitute an equivalent number of chapters in the book. What these topics have in common is that in recent years they have been the subject of discussion by theorists endeavouring ‘to swim against the tide’. In each chapter, at least two authors, mostly academics, give their take on the theme. In ‘The Body’, for example, Deborah Cherry wonders how Felix Gonzalez-Torres’s ‘candy pieces’ should be interpreted today. A work like ‘Untitled’ (Placebo – Landscape – for Roni) from 1993, where the individual sweets that make up the work can be picked up, unwrapped, eaten or taken away, turns perception into a multisensory experience rather than the modernists’ much-vaunted purely visual one. Moreover, ‘Untitled’ (Placebo – Landscape – for Roni) evokes personal as well as collective memories in the observer. But how does Gonzales-Torres’s work relate to today’s globalized world in which the public is infiltrating the private domain and vice versa, and in which synaesthetic experiences appear to be generally accepted? Also writing on the topic of ‘The Body’, Maaike Bleeker focuses on the changing relation between the cognitive perception of the observer and the physical presence of the performer. ‘Representation’ and ‘presentness’ are no longer contradictory concepts according to Bleeker. By way of example she cites the 2005 performance, Who’s Afraid of Representation? by Lebanese artist Rabih Mroué, a work that not only provides an incisive riposte to Amelia Jones and Tracey Warr’s book, The Artist’s Body, but also redefines the physical presence of the public. The idea that the observer has become a partner in the artwork and, even more than previously, an indispensable part of it, is floated in several of the essays. Many authors feel obliged to clarify their position vis-à-vis the ideas of Nicolas Bourriaud. They include Bleeker and Claire Bishop, a well-known critic of Bourriaud’s ideas, but also Hal Foster and, to a lesser degree, Jeroen Boomgaard and Beatrice von Bismarck. This not only tends to blur the strict division between the themes, but also results in an overlap in content. One cannot help wondering whether Relational Aesthetics (2002 / 1998) by Bourriaud (who took the easy option by submitting a chapter from that book for inclusion in Right about Now) is the only theoretical touchstone since the 1990s. It is odd that artist Liam Gillick was not sounded out on this theme. Gillick, one of the artists whose work inspired Bourriaud’s Relational Aesthetics, wrote a fierce response to Bishop’s article in the magazine October (‘Contingent Factors: A Response to Claire Bishop’s “Antagonism and Relational Aesthetics”’, October 115, Winter 2005). Gillick would appear to satisfy the editors’ desire to reunite art and theory. Or could it be that the theoretically versed artist actually undermines their contention that art and theory have been separate disciplines since the 1990s? The same question crops up when we look at the essays in the chapter entitled ‘Documentary Strategies’. Whereas Vit Havránek and Sophie Berrebi seek an ontological (Havránek) or historical (Berrebi) definition of ‘the documentary’, Kitty Zijlmans attempts to arrive at a better understanding of documentary strategies in contemporary art practice by way of a few examples. However interesting their respective ideas may be, the artist-philosopher Hito Steyerl writing in A Prior, summarily dismisses all the theorizing about ‘the documentary’, calling it ‘as blurred as the picture’ (‘Documentary Uncertainty’, A Prior no. 15, 2007, 303-310). Is it not high time that artists were brought into the debate, in the same way that the public has become an essential aspect of art? Surely the bringing together of diverse perspectives would serve to sharpen the discussion? As Right about Now. Art & Theory since the 1900s demonstrates, Allen’s somewhat resigned conclusion about exhibition making does not hold true for the making of a book. The publication sketches a very readable picture of recent art-theoretical thinking. The anthology of essays inspires, but also raises questions, in particular about the place of theory, inside and outside the institutions. Theory is no longer the preserve of academics, it transpires. The dividing line between theory and practice has become a fiction. Was the exciting collaboration between UvA, smba and W139 exhaustively exploited in Right about Now, one wonders? Perhaps with the second volume of Right about Now lectures, now in the pipeline, it will be possible to take the next step in the process of thinking about the place of theory.